The stately building that is the centerpiece of the Howe Commons office complex was originally constructed in the very early 1800s. The property consisted of a two and one half story Federal style brick farmhouse situated on approximately twenty-three acres. The home was owned in the 19th Century by a series of leading citizens including Dr. Henry Wickham Blatchley (from 1792), James B. and Mary Ann McNair, George W. Ketcham, and Charles and Margaret Fish who purchased the home and 27.48 acres in 1865. Subsequent owners removed the portico and columns and the property fell into a substantial state of disrepair during the economic depression of the 1930s. The property was foreclosed upon by the First National Bank of Pennington in 1941. 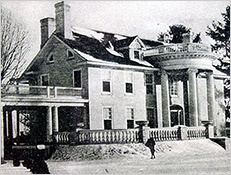 Dr. William J. H. Abey bought the home in 1942 and restored it into one of the premier residences in the Borough. 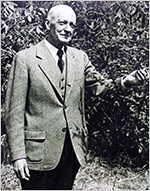 Dr. Abey sold the property to real estate developers Hunt and Augustine in 1968, who developed the residential neighborhood on the acreage behind the building extending along Abey Drive from Delaware Avenue to Curlis Avenue. They converted the mansion into an office building and constructed two other office buildings to resemble the original building. The fourth office building was constructed in 1985 and in 1999 became the world headquarters of The Electrochemical Society. William P. Howe Sr. arrived in Pennington in 1910. During the next half-century he became an extraordinarily influential force in shaping the community of Pennington including having twice served as Mayor of the Borough. 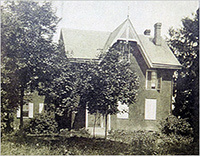 He developed the Sked and Curlis farms into the neighborhoods that comprise the southern half of the Borough. Howe Nurseries, the horticultural compliment to his real estate development business, was headquartered in one of his former homes at 304 Burd Street and was an economic landmark in the Borough until its demise in the 1970s. His retail store was located at 250 South Main Street and the nursery fields dominated the eastern side of the Borough including the lands that now comprise Baldwin Street, Maple Lane, Birch Street, Linden Lane and Woodmere Way.